KONG! The eighth wonder of the world! The God of Skull Island! Terror of both T-Rexes and Art Deco skyscrapers! Renowned as one of the angriest, hairiest and most potent metaphors for nature's untamed fury in cinema! The most famous giant gorilla in the world has lumbered and smashed his way across cinema screens for 80 years and now he's here! Tonight! In London! And he's maybe a foot tall. King Kong (A Comedy) is the latest in the fertile genre of staging high-spectacle blockbuster action on a threadbare budget. These have ranged from Paranoid Dramatic's stab at Ridley Scott's Alien to Superbolt's (actually quite moving) take on Jurassic Park - which I saw in this very theatre. These productions are fuelled by curiosity: how is a fringe theatre company working to a strict budget going to put a giant angry gorilla on stage? Creator Daniel Clarkson, who's already managed to cram the entirety of the Harry Potter story into a single short show, throws the kitchen sink at the problem. So Kong is variously a puppet, a man in an ape costume, a giant hand, and, memorably, a cardboard cut out of the 8-bit Donkey Kong. It works, the show skating through the skeleton of the 1933 film's plot - taking us from the bustling streets of depression era New York to the overgrown pulp adventure of Skull Island and back again. Our adventurers are egotistical filmmaker Carl Denham (Rob Crouch) and squeaky ape-fodder Ann Darrow (Alix Dunmore), assisted by a variety of characters played by Ben Chamberlain, Sam Donnelly and Brendan Murphy. What follows is 80 minutes of family-friendly comedy that's just on the border of panto. Rob Crouch is responsible for most of the best bits, his sonorous voice a fantastic fit for the subterranean echobox of The Vaults. He chews more scenery than Kong chews bananas, continually busting his way through the fourth wall and has the show's one inarguably killer line when he muses on the stupidity of a society so primitive it thinks it can protect itself with a giant wall. 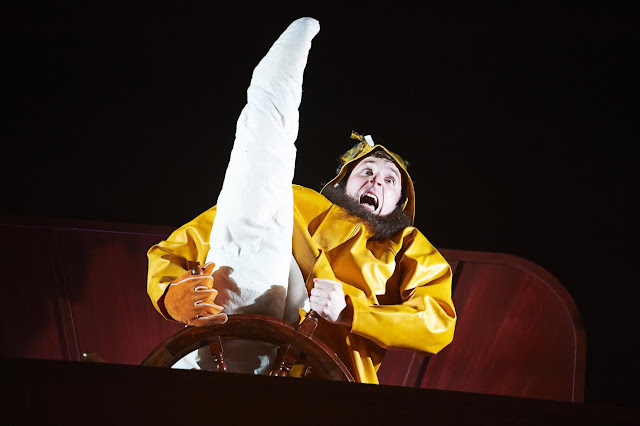 But here's the thing, though there's a tonne of imagination gone into the staging and the actors all have well-developed funnybones, King Kong (A Comedy) simply isn't half as hilarious as it probably should be. Don't get me wrong, it's funny (it passed the 'five laughs' test at any rate), but it's no gutbuster. There are a smidge too many self-referential gags where we're expected to laugh about how predictable the humour is. For example, a character is given a gas grenade and is told to pull the pin and throw the grenade. Naturally, the pin is soon sailing through the air - a solid gag, but hardly an inspired one. Also failing to hit the mark is Ben Chamberlain's 'adenoidal nerd' stereotype, most of whose antics are met by, at best, mild titters. By the end, I began to pay attention to the audience rather than the show - noticing that while they seemed relatively engaged they weren't exactly rolling in the aisles. But in an unexpected twist, the show plays the Empire State finale almost completely straight. At the rear of the stage a puppet, expertly manipulated by the cast, moves in slow motion to Barber's Adagio for Strings and tries his best to fend off his fate. In the moment he beats his chest in one final act of defiance against civilisation, this parody actually manages to properly encapsulate the tragedy of Kong. King Kong (A Comedy) is not breaking down any comedy boundaries. It's probably a good shout if you've got small children you're looking to entertain (and would most likely make a good double bill with the well-received production of Alice's Adventures Underground being staged alongside it in the Vaults). But, ultimately, it's just not that funny. King Kong (A Comedy) is at the Vaults until 27 August. Tickets here.